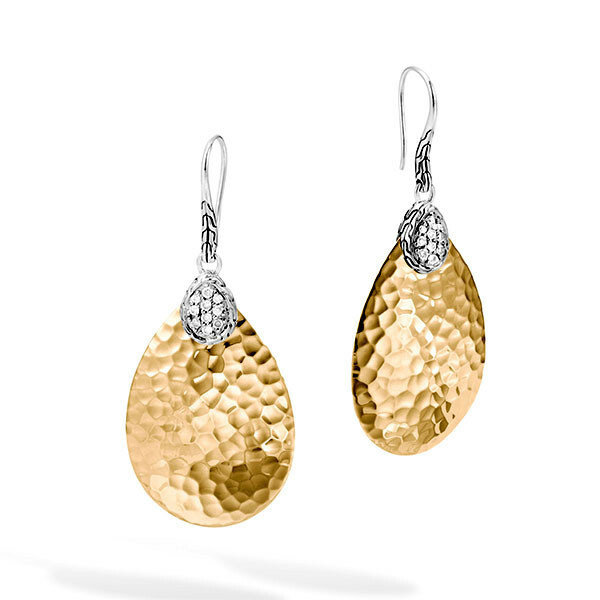 The mix of 18kt yellow gold, sterling silver, and white diamonds on this set of John Hardy drop earrings from the Classic Chain collection is gorgeous. Small teardrops of sterling silver, laced with white diamonds and framed in the classic chain motif, dangle brilliantly from French wires as they hold larger leaves of 18kt yellow gold which are gently hand hammered for a rippled design. The two-toned effect is absolutely stunning as you will be whenever you wear these John Hardy beauties.